I have tried to post some photos on the “photos” page – of where I live now (Bishqem) and of a recent trip to nearby Pajove (a 10 min walk away – where I am using the internet right now). This past weekend one of the volunteers in Pajove celebrated his birthday with a picnic. We walked the 1 km from Bishqem to join in the fun. It was a beautiful spring day, and the flowers were out as we hiked up to a row of abandoned houses in “old pajove” up the hill from the main road. This coming weekend I will be traveling to Gramsh (1.5 hours to the south) to visit with a current volunteer there for three days. This volunteer visit is meant to be an outlet for our questions and concerns about placement and life after training. I’ll be glad to see a little more of Albania and get away from the hectic life of language and technical sessions for a bit. It’s crazy to think that in just two weeks I will know about where I will be for my permanent site placement, after PST. Laura! 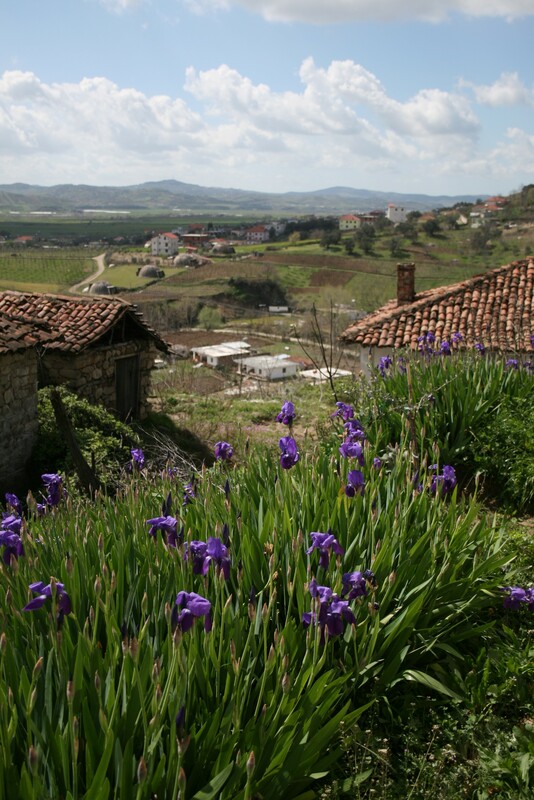 Albania looks beautiful–a land of contrasts as you mentioned earlier. I’m thrilled to hear that your journey is off to a great start….Love seeing your pictures and hearing your perspectives…you’re providing a wonderful outlet to the regular Cville hum-drum! Safe travels this weekend and have fun! I loved looking at your photos and hearing about your family/life/outings! Choosing between Tulane and UVa is ridiculously difficult, but otherwise I am just enjoying our early summer weather! Loved the title of the last post- it makes me think of driving home from Maine with you. The photos say it all. So glad that you posted them. It looks like a wonderful place. Can’t wait to see it! The views of the mountains are special considering the time we spent together in Nepal and the Appalachians! hey ther i’m Altin Pepa how live’s in (Pajove) Peqin Albania????? wher is yoy photos i like too see the too!